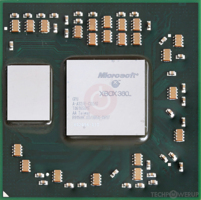 The Xbox 360 GPU was a graphics card by ATI, launched in November 2005. Built on the 90 nm process, and based on the Xenos graphics processor, in its Crayola 6 variant, the card supports DirectX 9.0c. The Xenos graphics processor is an average sized chip with a die area of 182 mm² and 232 million transistors. It features 240 shading units, 16 texture mapping units and 8 ROPs. ATI has placed 512 MB GDDR3 memory on the card, which are connected using a 128-bit memory interface. The GPU is operating at a frequency of 500 MHz, memory is running at 700 MHz. Being a igp card, its power draw is not exactly known. This device has no display connectivity, as it is not designed to have monitors connected to it. 48 floating-point vector processors for shader execution, divided in three dynamically scheduled SIMD groups of 16 processors each. for color, alpha compositing, Z/stencil buffering, and anti-aliasing called “Intelligent Memory”, giving developers 4-sample anti-aliasing at very little performance cost.